Animals in zoos don’t have the same opportunities for physical and mental stimulation that wild animals do, so zookeepers provide the animals with objects or changes to their environment that will stimulate the behaviors of healthy wild animals. Enrichment gives animals something to think about, encourages exercise, and gives animals a degree of control of their environment by giving them choices. Basically, enrichment helps keep life interesting and challenging. Imagine that you are sitting in your room, feeling a little bored, and you suddenly notice a strange new something hanging from your ceiling. Somethingbrightly colored, kind of round, with – could it be – a snickers bar inside? Chances are you’d be figuring out a way to check out this new thing pretty fast. Could you stand on a desk or chair, do you need a ladder, could you knock it down? You’d be using your natural human problem solving skills to try to figure out what this new thing was and what to do about it. That is enrichment! Zookeepers provide different types of enrichment to stimulate all of the senses and encourage a wide range of natural behaviors. 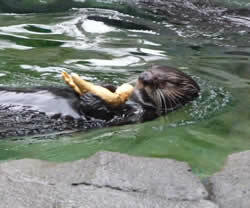 Categories of enrichment include foods & feeding, sensory, novel objects, environmental as well as behavioral & social. Click on one of the following for more information. Food is frequently used as an enrichment tool because it solicits the natural hunting and foraging behaviors of animals. 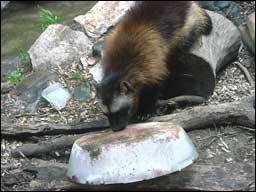 Providing task oriented puzzle feeders and presenting food in different ways encourages animals to think and work for their food, as they would in the wild. Food with interesting textures or new flavors, and food that is hidden in hard to reach places, all make good enrichment. Many animals love “Popsicles,” not the kind people eat but special ones zookeepers make like meatcicles for tigers or fruitcicles for primates. 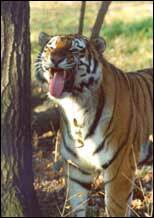 One of the Zoo’s tigers used to put her bone popsicles into the tiger pool to make them melt faster! Senses are extremely important to animals; it helps them to understand their environment and who is in it. Sensory enrichment includes visual, olfactory (smell), auditory (hearing), taste and tactile stimulation. Playing music or sounds of nature provides auditory stimulation that can both excite or calm an animal. Tactile stimulation might be a scratching post or a pile of snow! Providing new smells in an animal’s exhibit can encourage exploration and sometimes triggers territorial behaviors like rubbing and scent marking. 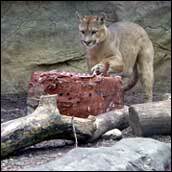 A wide variety of scents are used for enrichment including spices, cooking extracts, perfumes and animal urine. 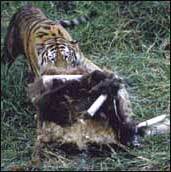 The tigers love “Obsession” and “Charlie” perfumes. The tapirs, tree kangaroos, binturongs and gibbons go for banana extract! Novel objects are enrichment items that can be manipulated in some way with hands, paws or hooves, mouths, horns or even tails. Placing these objects in an animal’s environment can cause the animal to display all kinds of natural behaviors ranging from exploration to play. Paper mache piñatas to stalk and tear apart, boomer balls to bat around, a telephone book or box to shred and even kong toys and chew ropes (the kind you might use at home for your pets), can all be lots of fun for animals. 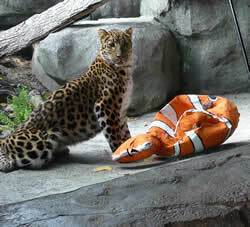 Non-natural objects, such as balls and boxes, are usually used in the animals’ off exhibit spaces but novel objects can be natural too. Gourds, coconuts, pine cones, pumpkins and fir trees all make great enrichment. Depending on the size of the animal, branches or whole fir trees are put into exhibits for the animals to investigate, move around, and tear apart. These items help the animals perform necessary behaviors during natural seasonal cycles. Placing branches in the moose and caribou exhibits during rut, for example, helps the animals to shed the velvet on their antlers. Environmental enrichment refers to enhancements made to an animal’s space that provides changes in structures or adds complexity. It might be new vines or branches added for climbing, pools or wallows for bathing or cooling off, or a variety of substrates for foraging. For wild animals, social behavior is key to their survival. Courtship and reproduction, feeding and foraging, territoriality and defense can all be social in nature. We strive to maintain our animals in appropriate social groups (housed alone if they are solitary or in herds or families if they are social). Many of our exhibits house multiple species which presents both behavioral challenges and opportunities. Positive, appropriate interaction between keepers and animals helps build trust and aids in the daily care of the animals. Beyond the day to day routine interaction, our zookeepers/trainers also use operant conditioning techniques to train many of our animals. Training provides necessary mental stimulation because it involves learning. The animals learn to perform behaviors in response to the trainer’s cues and are rewarded for correct responses. In addition to providing beneficial mental stimulation, training husbandry behaviors allows the zookeepers and vets to examine and care for the animals without using procedures that are more invasive and stressful. Animals are taught to go on scale for weighing, to present various body parts for examination and even to allow staff to perform ultrasounds, give vaccinations or take blood. By teaching the animals to cooperate in their care, we can provide them the best care without undue stress. Planning effective enrichment starts with researching the natural history of the species. Knowing how wild animals navigate their environments, what foods they eat, what their primary senses are etc can aid in planning appropriate habitats and activities for our Zoo animals. Setting behavioral goals and planning how to achieve them is only the beginning. Monitoring the behavior of our animals is part of the equation too. Knowing where and how the animals are spending their time can aid in planning new initiatives or in evaluating whether the activities we are doing are effective. For example, behavioral data collected on our three brown bears can tell us how much time each bear spends fishing, climbing, or sleeping as well as how they interact with each other and their environment. Animals have individual personalities and preferences. 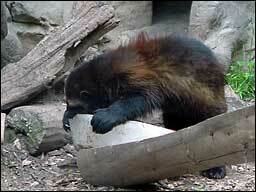 If enrichment is placed in the trees versus the pool, which bear is likely to get it? Enrichment planning and evaluation is aimed at meeting the needs of the species and the individual.